California Clipper–ը Cavite–ում, Ֆիլիպիններ, 1940. Bowers, Peter M. «The Great Clippers, Part I.» Airpower, Volume 7, No. 6, November 1977. Bowers, Peter M. «The Great Clippers, Part II.» Wings, Volume 7, No. 6, December 1977. Bridgeman, Leonard. «The Boeing 314-A Clipper.» Jane’s Fighting Aircraft of World War II. London: Studio, 1946. ISBN 1-85170-493-0. Brock, Horace. Flying the Oceans: A Pilot’s Story of Pan Am, 1935—1955. New York: Jason Aronson, Inc., 3d edition: 1978, ISBN 0-87668-632-3. Dover, Ed. The Long Way Home — Revised Edition. McLean, Virginia: Paladwr Press, 2008. ISBN 0-61521-472-X. Klaás, M.D. «Clipper Across the Pacific, Part One.» Air Classics, Volume 25, No. 12, December 1989. Klaás, M.D. 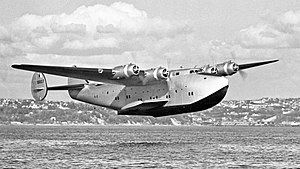 «Clipper Across the Pacific, Part Two.» Air Classics, Volume 26, No. 1, January 1990. Klaás, M.D. «Clipper Flight 9035.» Air Classics, Volume 29, No. 2, February 1993. Klaás, M.D. «The Incredible Clippers.» Air Classics, Volume 5, No. 5, June 1969. Klaás, M.D. «When the Clippers Went to War» Air Classics, Volume 27, No. 4, April 1991. Ինքնաթիռներին նվիրված կայք // lyingclippers.com. «Honolulu Clipper» ինքնաթիռի պատմություն // rbogash.com.